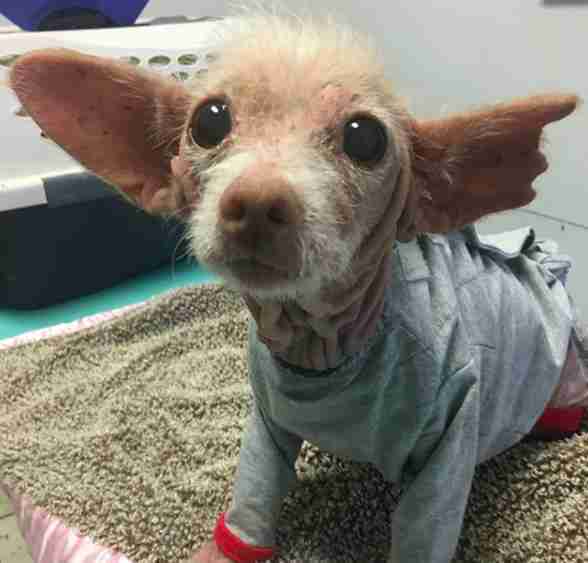 Blossom was dropped off at a Los Angeles shelter as a stray in mid-April, and the shelter staffers were immediately baffled. The tiny dog was pretty much completely bald, and they weren’t sure if it was because of mange, scabies or allergies. 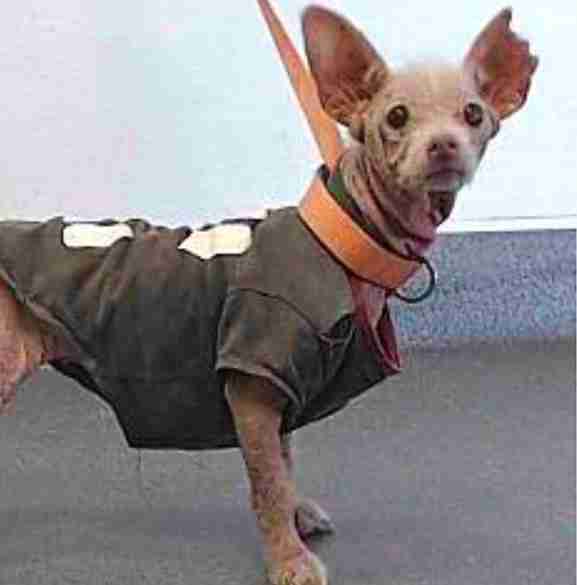 They couldn’t afford to do extensive testing on her and they weren’t sure how to go about treating her, and so she sat in her kennel, untreated and unnoticed, waiting for someone to take a chance on her. Gretchen May was browsing shelter websites one day, looking for another dog to add to her already full household, when she came across a post about Blossom. She immediately felt a pull toward the sad little dog, and despite Blossom’s appearance and obvious issues, something was telling May that this was the dog she had been looking for. 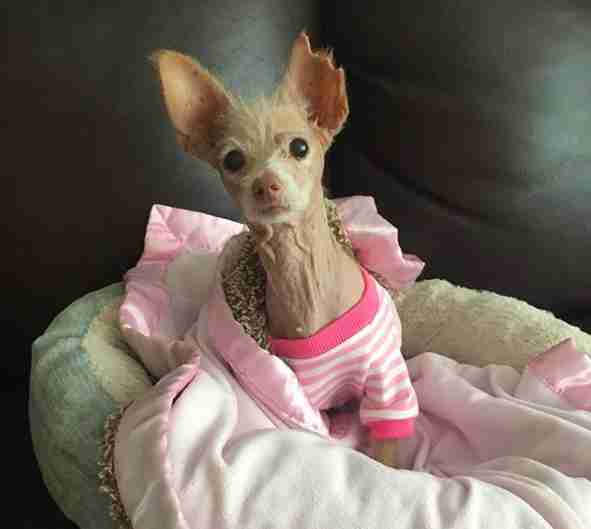 Since May lives in San Diego, she reached out to Precious Pals Pet Rescue to see if the group would be willing to pull Blossom from the shelter. 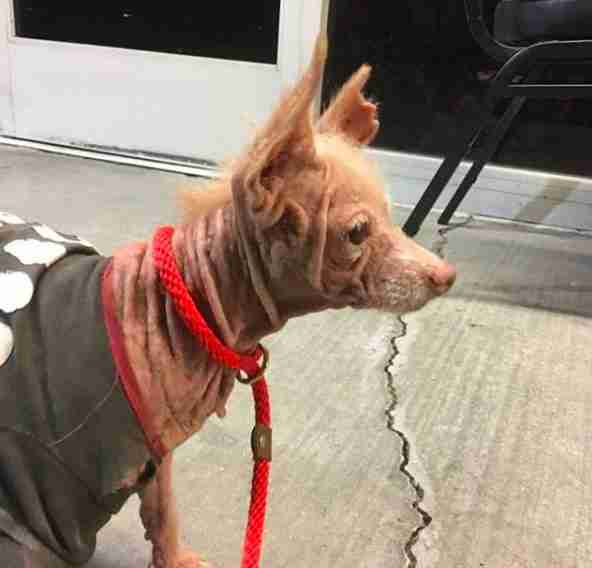 The rescue fell in love with Blossom’s tiny bald face and quickly agreed, rushing her to the vet to get checked out before she headed off to her loving forever home. 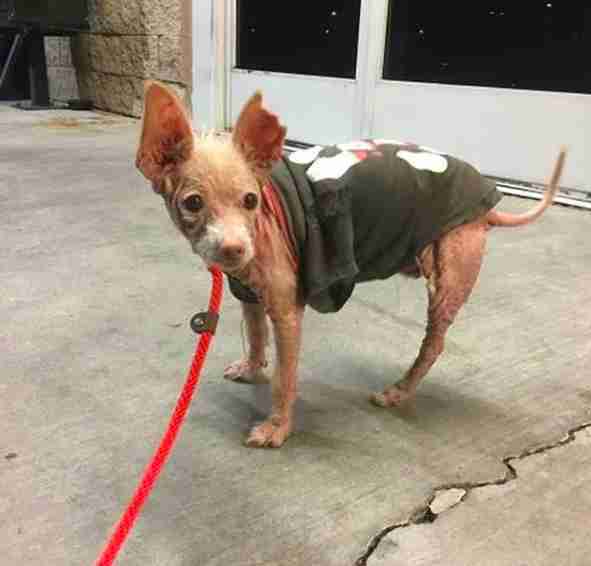 When Blossom first arrived in her new home, she was still in pretty rough shape. She was suffering from an upper respiratory infection, kennel cough, skin wounds and ear infections, and, of course, she was still very bald. Now, a month later, Blossom is still recovering from her initial issues, but she’s still bald — and her new family isn’t sure why. It’s possible Blossom is suffering from allergies — and her family is hoping if that’s the case, her allergies will resolve themselves once all of her other issues have been resolved. They also have no idea what kind of dog she is, which could be playing a role in her baldness as well. 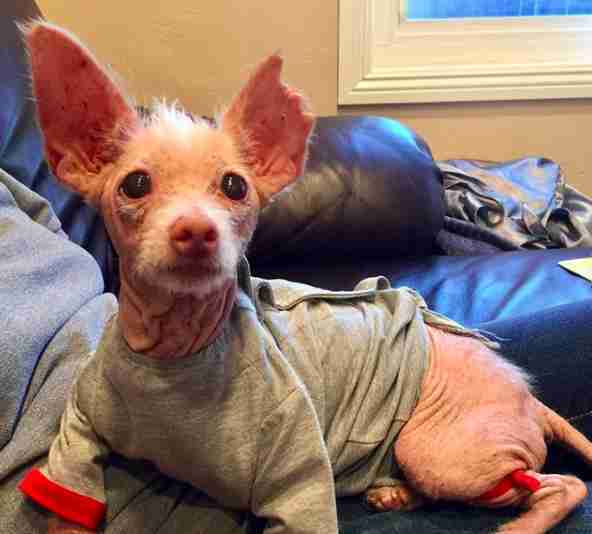 Blossom’s past is a complete mystery, but wherever she came from and whatever breed she is, her new family is so glad she’s now theirs — and they really don’t care what she is or if her hair ever grows back, as long as she’s happy and healthy. “We are still getting to know her, but she is sweet, calm, loves to be in laps and loves attention,” May said. Despite her rough start to life, Blossom is now thriving in her forever home, and her new family can’t wait to watch her grow into herself more and more every day. You can follow Blossom and all of her adventures on her Instagram account.